There are new details on the White House fence jumper. Hong Kong protesters brace for a possible police crackdown. And ATM fees average $4.35 per transaction if you go off-network. Wild chase: The man who jumped the White House fence earlier this month made it farther than originally thought, officials said yesterday. Omar Gonzalez, a 42-year-old Iraq war veteran who had a knife in his pocket, overcame one Secret Service officer and ran into the East Room of the White House, where he was then subdued, a federal law enforcement official said. 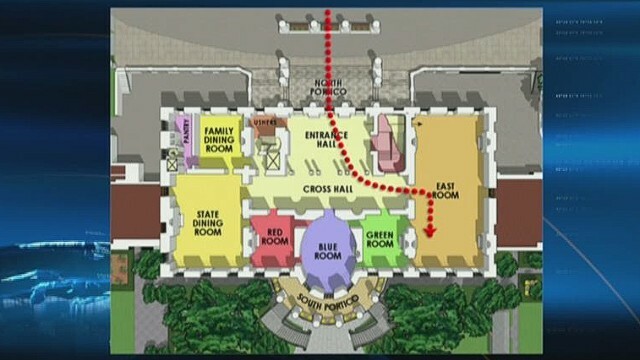 The Secret Service previously said that Gonzalez was stopped after entering the front door of the North Portico. Blame game: In his "60 Minutes" interview, President Obama said the U.S. "underestimated what had been taking place in Syria" that allowed the country to become "ground zero for jihadists around the world." But some are questioning how that could be since a top intelligence official said more than a year ago that ISIS has "ruthlessly grown in effectiveness." In October a senior administration official said the terror group represented "a major and increasing threat" - to the region and the United States. And Eight months ago, the military's top intelligence official warned ISIS "will attempt to take territory." Is there a three-strikes rule in government? Standoff: Thousands of demonstrators bracing for the possibility of a police crackdown stood their ground in the heart of Hong Kong today. Protesters had masks, protective goggles and plastic raincoats on hand as they camped out on the main thoroughfare leading into the city's central business district. The demonstrations began in response to China's decision to allow only Beijing-vetted candidates to run in the city's 2017 election for chief executive. Protesters say Beijing has gone back on its pledge to give Hong Kong "a high degree of autonomy" when it was handed back to China by Britain in 1997. Hong Kong Chief Executive C.Y. Leung said today that China will not back down from its position on Hong Kong. The government says 56 people have injured in the protests since violence flared on Sunday. Making a connection: The arrest of Jesse Matthew - the suspect in the disappearance of University of Virginia student Hannah Graham - has resulted in a "significant break" in the 2009 death of another young woman in the same area, police said. Virginia State Police say there is a "new forensic link" between the Graham case and the death of Morgan Harrington, a 20-year-old Virginia Tech student, who went missing after attending a Metallica concert in Charlottesville in October 2009. Her remains were found on a farm months later. Graham remains missing. Investigators think Matthew was the last person with Graham. He is charged with abduction with the intent to defile in the case, according to Charlottesville police. Cashing in: It's more expensive than ever to get your hands on your own money. The cost of fees at ATMs has jumped 5% in the past year, according to Bankrate, a company that tracks such things. On average, a customer is charged $4.35 for each transaction. Of course, you can save money by avoiding out-of-network ATMs. But that's part of the problem too. Banks are hiking fees to make up for all the folks who are using them for free. –Cancer kid: Hannah, a brave five-year-old cancer patient, gives us the lowdown on her months of treatment and surgeries. Be prepared for her to steal your heart. - How do people discover these things? : This caterpillar squeaks when you grab it. - Interspecies grudge match: Ringo the raccoon and Rock the coonhound wrestle on the porch. - Robot cheerleaders: We still prefer the real thing, but the technology is cool. –Predators: Cameras catch a pod of killer whales as it attacks a Tiger shark. Wasn't the ATM Fees story front-page on CNN yesterday? Yes it was, David. CNNMoney carried the story. 1. Why should the Secret Service care if the Main Man doesn't? 2. The man has attended less than 50% of the security briefings why is anyone surprised he doesn't know? 5. It's business you don't like it try cash or another bank or credit union. Well, now that ATMs are much more advanced, it looks like the Future Bank Initiative is making a comeback. It makes sense for profit-hungry stockholders who care nothing for customer service. It looks like the Fist Union philosophy that customers are a necessary evil to be tolerated at best and ignored whenever possible, is also making a comeback. So, we'll replace our people with machines, reducing expenses and increasing profits. But wait, how will we deal with these increased profits? Why, that's easy: We'll raise our fees. Makes perfect sense. Hannah is truly a beautiful brave little girl!!!!!!!! Never knew caterpillars squeaked.